Think you’ve figured Instagram out? 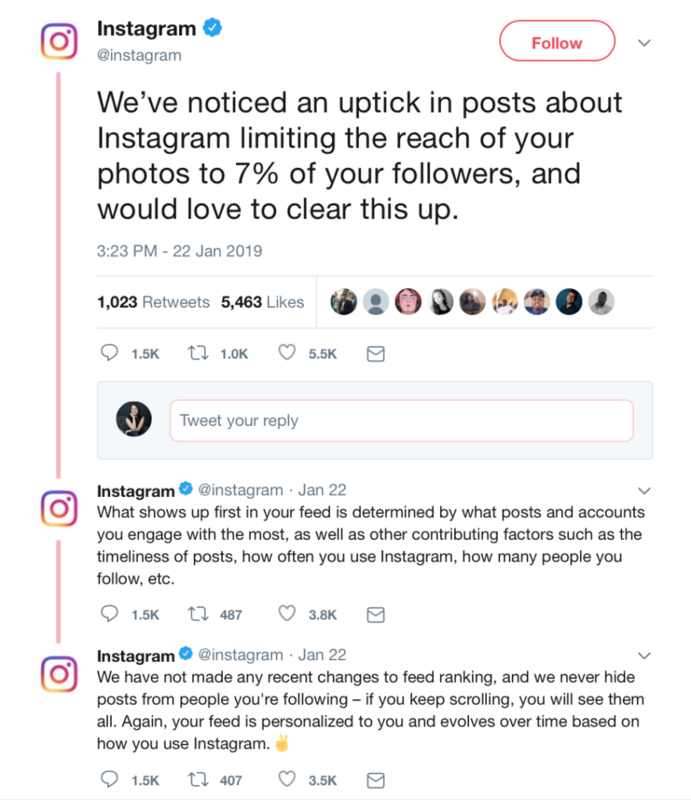 We're not saying you need to throw everything you know about Instagram out the window, but there are definitely some updates to the platform that you should be aware of if you want to keep expanding your reach in 2019. The app is constantly updating its algorithm and adding in new features, so here's a rundown of what's changing and where you should be directing your efforts to keep your engagement up. How Instagram's algorithm works isn't entirely public knowledge, but the company is pretty transparent about what content it favours. More than anything, they want to see active engagement and that doesn't just mean people engaging with you, it means you're engaging with them too! The more time you spend in the app, tagging people in your content, commenting, and following people, the better. Instagram's algorithm takes all of this into account when it's deciding where to place your post in people's feeds, so make sure you dedicate a little time each day to mingling in the app, as it will have a direct effect on how many people are seeing your content. It's also important to note that Instagram curates people's feeds based on what content they engage with on a regular basis. The more often they engage with something, the higher up that thing will appear on their feed. The less they engage with something, the more Instagram will edit that content out of their feed (or, rather, relegate it to the end - which effectively has the same result). So, stay focused on producing content which speaks to your people and use analytics as your guide wherever possible to determine what content is performing for you. This isn't exactly new territory, but it's worth saying that the Instagram algorithm also takes into account the frequency of your posts and how recently something was posted when it's deciding where to place your content in someone's feed. Post often, but keep it engaging and meaningful for your audience. It's not just the app that's evolving. It's the users too. People are starting to understand how influences and branded content work and they really resent when people aren't honest with them about it. Of course, you're allowed to be an affiliate and take on sponsorships, but just be upfront and transparent about it. People still want recommendations and advice about things, and they understand you need to make a living, but they're ultimately going to engage a lot more with someone they feel is being honest and who isn't going to make them feel foolish later on. People are getting tired of glossy photoshoot images and perfection in general and that's why being authentic and genuine are the content trends for 2019. Share personal and meaningful insights with your audience, be upfront with them when things don't go exactly to plan, and dot your feed with impromptu images whenever possible. People want to know you're real, so let them see that you are. Overall feed engagement has been on a decline for the last year or so, so if you've noticed yours dipping, you're not alone. There are more people out there producing content than ever before and that means grabbing people's attention AND getting them to engage takes a bit more creativity than it might have to date. Because of this, if you haven't used Instagram's stories feature yet, it's probably time to dip your toes into the water. It's exploded and has something like 400 million active users now. Plus, stories are discoverable to people who don't follow you and offer a more genuine way of connecting with people; which we now know is a trend for the coming year. It's expected that Instagram will create more widget style stickers for their stories feature and there's a good chance they'll even let you make your own branded ones too, so keep your eyes peeled for that! If you haven't used these before, they're basically just... well... stickers you can put on your stories, but they can also add ways for people to engage and make the story experience entirely more dynamic. There is a countdown sticker that can countdown to whatever date/time you choose, a questions sticker that allows you to host a pro looking AMA, a music sticker that lets you add whatever song you want to your story, a poll sticker that lets you conduct real-time polling, but these are just a few so, for a more extensive list of options and sticker descriptions, click here. Overall, stories and stickers are great ways to drive engagement and, when you take care of your audience like that, the algorithm will take care of you too. Keeping up with how social media works is no small job, but if you stay flexible and follow the steps above, you'll be able to extend your reach in 2019!